About Sherry Benninger | East Bay Real Estate Agent at The Grubb Co. I have always been passionate about excellence, achievement and results. In real estate, this means setting appropriate expectations and then exceeding them. I offer a level of knowledge, experience and insight that provides my clients with the competitive advantage they need to maximize their profits. Real estate is an art, a discipline and a way of life. With more than two decades of experience as a seasoned real estate professional and hundreds of successful real estate transactions, I look forward to each new client, and each new home. Prior to beginning my career in real estate, I designed sportswear for several prominent companies and then launched Staccato, a successful knitwear company with showrooms in New York, Los Angeles, San Francisco, and Dallas. The design, marketing and business skills I accrued while running Staccato translated directly to real estate. In preparing my clients’ homes for the market, I use my design experience to oversee color selection, staging, and landscaping. My business and marketing skills help shape our marketing strategy. I help my clients through the process, from start to finish. I bring a unique combination of passion, skills, aesthetics and experience to the process. Pro-active communication with clients, attention to detail and dedication to my clients’ needs are integral in my business. I will always tell you what you should know, and not what you want to hear. My knowledge of the nuances of real estate transactions and continual analysis of the market contributes to my ability to price properties strategically. 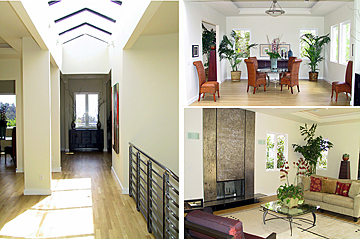 With my comprehensive knowledge of the Oakland Hills real estate market, I develop flexible, customized strategies that ensure successful transactions for my clients. My style is efficient, professional, and approachable. My role is to help you maximize the return on your investment, and guide you through a complex process. If you're considering buying a home in the Oakland Hills, or if you are selling and looking to move to a different neighborhood, I hope you'll contact me. Thank you for considering me! It was an honor to participate in the 2007 Alta Bates Summit Celebrity Golf & Tennis Classic, that raised over $345,000 for the Medical Center's programs for youth. 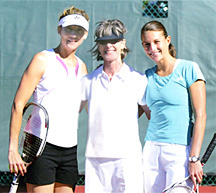 To play tennis with Monica Seles (left) and Corina Morariu (right) was a real thrill! In 2008, I participated again in the Alta Bates Summit Celebrity Golf & Tennis Classic, helping raise money for the Medical Center's programs for youth. 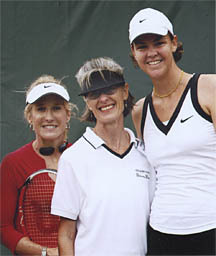 This time I got to play with Lindsay Davenport and Tracy Austin... I am so fortunate! 2019 Sherry Benninger. For informational purposes only. No reprinting of this material is allowed without express written permission.